Acupuncture involves needles applied to contact points on the skin. Research suggests acupuncture causes the release of endorphins, natural painkillers produced by the brain when we feel stress or pain. It has been used to treat everything from migraines to dietary issues. But now technology has come up with a modern twist: instead of needles, laser acupuncture applies a powerful pinpoint of light to the skin. Lasers may conjure up images from science fiction, but they have become valuable tools in a wide range of fields, from hair removal to teeth whitening. In laser acupuncture, the laser directs intense light to a specific point on the skin. This point corresponds to one of the points where a needle would traditionally have been applied. Lasers offer a huge advantage over needles. The laser doesn’t break the skin, so it doesn’t risk infection. The laser is bright but not hot, so patients don’t experience pain. And for patients with a fear of needles, lasers are a benign alternative. In 2014, the University of Dundee in Great Britain analyzed data from a research project in Saudi Arabia. Conducted by PhD research student Abdullah Al-Rashoud at the Security Forces Hospital in Ryadh, the project used lasers to treat 49 volunteers suffering from crippling arthritis pain. Arthritis pain can be debilitating for its victims. Drugs are certainly an option, but these may have side effects including upset stomach and even heart attack or stroke. 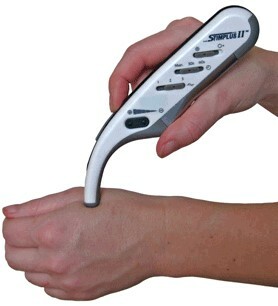 Laser acupuncture may be an option to consider if you suffer from painful arthritis.